Alhambra Preservation Group has a busy year ahead – filled with fun and educational events, and we’d love for you to join us. Pencil these events into your calendar now and stay tuned for more details as the year progresses. Join APG on a tour of Pasadena’s Gamble House (4 Westmoreland Place, Pasadena) as part of the Museums of the Arroyo free day on Sunday, May 15, 2016. We’ll meet at 11 a.m. at the Gamble House. Look for an APG member holding an Alhambra Preservation Group sign. Tours will begin at 12 noon. Join APG at 7:00 p.m. on Wednesday, June 29, 2016 at the Alhambra Civic Center Library (101 S. 1st Street) for an event entitled got architecture?, a virtual tour of Alhambra’s diverse architecture found in our city’s homes, businesses, churches and schools. The event is free and everyone is welcome to attend. Ample parking is available beneath the library and light refreshments will be served. This summer APG will coordinate a fundraising dinner at Alhambra’s historic Diner on Main. Come and enjoy a meal, raise money for Alhambra Preservation Group and learn more about the Diner on Main’s Googie architecture. This November Alhambra will elect two new council members. Alhambra Preservation Group will offer its members and supporters the opportunity to meet Council candidates over a scoop of ice cream in September. We’ll also vote to see what ice cream flavor is Alhambra’s favorite! Alhambra is in the process of drafting a new General Plan. The City of Alhambra has announced that the new General Plan will be released in the fall of 2016. After its release, residents will have 45 days to comment on the draft plan. We’ll be sure to let you know when that comment period is happening! APG’s 2016 Heritage Awards will take place in November this year. This annual event celebrates and honors Alhambrans who have worked to restore and rehabilitate their homes. If you know of any homeowners whose efforts may qualify for this award, please feel free to send their information to us at info@alhambrapreservation.org. A meticulously restored 1906 Victorian Transitional Bungalow, located in the Wuest tract of Alhambra, was recently honored with Alhambra Preservation Group’s 2014 Katherine Hildreth Memorial Heritage Home Award. In presenting the award, APG President Christine Olson remarked that in the three years since purchasing the home, its owner has done an extraordinary job of restoration, preparing this historic gem for another century of functional use. This impressive home is located near the former Red Car line that carried passengers along Huntington Drive, to and from the business center in downtown Los Angeles. In 1906, the original owners, Fred and Emma Shuttleworth, purchased an unimproved lot from Samuel Wuest. Fred Shuttleworth, a Freemason, hired his fellow lodge member George W. May to build a five-room cottage for his family. Sixteen years later, in 1922, the Shuttleworths had a small guest house constructed at the rear of the property. It, too, was a one-story bungalow, which closely matched the style of the original home. As a rental unit, the additional income helped to ensure a comfortable retirement for the elderly owners. The Shuttleworth home was designed as a Craftsman bungalow, incorporating elements of the earlier Victorian style in its window treatments and interior details, such as the Birdseye maple woodwork, dentil moldings, high ceilings and tall windows. The Craftsman style is characterized by the rustic texture of building materials, including shingles and redwood siding; a low-pitched roof with exposed rafter tails; and a covered front porch supported by substantial posts. There are two large bay windows – one in the front parlor, and another in the dining room. Most of the original double-hung windows are still present, featuring a distinctive diamond pattern in the upper section. When the current owner first saw the home in 2011, she fell in love with its expansive dining room, which features a small Victorian fireplace and mantle, flanked by turned maple columns and detailed scrollwork. In restoration, instead of replacing the too-worn-to-be-refinished hardwood flooring with a less-expensive laminate material, the owner special-ordered maple floorboards to match the original. The beautiful grain of the new hardwood maple floors lends an elegant quality to the 108-year-old home. Helping to transform the social dynamic on the street by creating a sense of neighborliness and community spirit, the owner installed a Little Free Library in her front yard, constructed from salvaged fencing material. This is the first such library to be officially registered in Alhambra. Even as this home celebrates its history and its place in the local community, its environmentally conscious upgrades (including solar panels and an electric vehicle charging station) position it solidly in the twenty-first century. This is the last in a series of articles featuring the 2014 Heritage Home Award-winning residences. 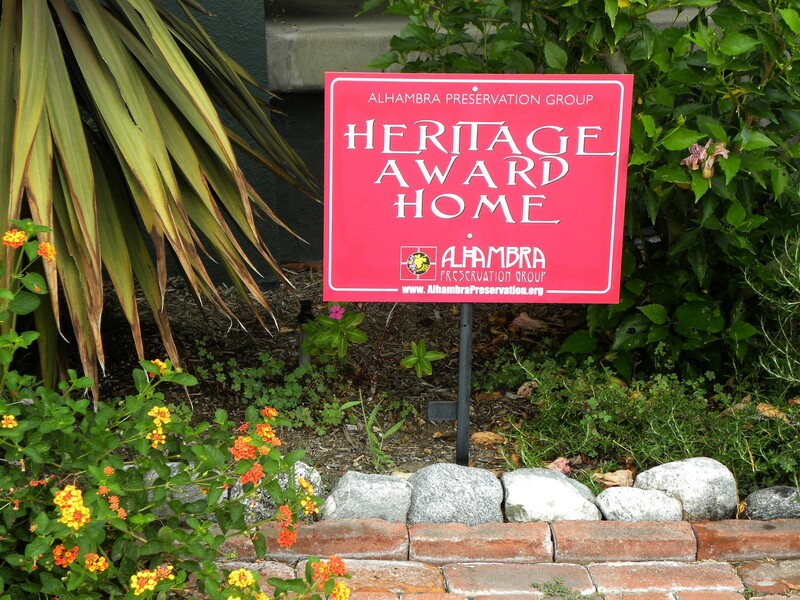 Alhambra Preservation Group will present its 2014 Heritage Home Awards to the owners of three exceptional Alhambra homes on the evening of Wednesday, November 19. This year’s event will take place at 7pm in the Alhambra Civic Center Library’s Reese Hall, 101 South First Street, and is free to the public. Please join us for a fun and informative evening! Light refreshments will be served and ample free parking is available in the library’s underground parking structure. The presentation will mark the seventh year of APG’s Heritage Home Awards program, which recognizes homeowners who have restored or maintained their older, historic homes in a manner that is sensitive to their architectural period and style and that recognizes the value of these properties to the community at large. The evening’s program will showcase each of the homes through an educational and inspiring audio-visual presentation, offering both exterior and interior views of three of Alhambra’s extraordinary historic residences, along with insights into the history and context of each. APG President, Chris Olson, describes the event as, “a virtual home tour, without the walking — or the price of a ticket!” We have a few surprises in store for you this year, including the former home of a storybook princess, a property that was actually declared a public nuisance before it was thoroughly rehabilitated, and the location of Alhambra’s first Little Free Library. Adding to the fun, attendees will have the opportunity to win a special prize, dinner (and drinks) for two at The Barkley restaurant in South Pasadena. Alhambra Preservation Group was founded in 2003 by residents eager to promote and protect Alhambra’s rich and historic architectural heritage. As a nonprofit organization, APG is supported by the generous contributions of its members and friends. We thank you for your support. You can learn more about APG by visiting our website or following us on Facebook! A stunning 1932 Spanish Colonial Revival home, located in the Alhambra Park tract, received the 2013 Katherine Hildreth Memorial Heritage Home Award by Alhambra Preservation Group in a recent award ceremony. “The homeowners of this historic home have done an extraordinary job of restoring and rehabilitating this house since they purchased it a decade ago. It is a great example of the way historic preservation can pay big dividends to communities by enhancing property values and restoring neighborhood character and pride,” stated APG President Christine Olson in presenting the award. When the current owners first saw the home in 2004, they fell in love with the home’s distinctive historic character and many original features – Spanish arches, hardwood floors and hand-troweled plaster walls. Despite its charm, the home needed a lot of TLC, so they went to work to make this house their own. They tore up old carpeting and refinished the original hardwood floors. They found a color palette that better reflected the home’s style. They redesigned the home’s “modern” 1950’s kitchen into one that is highly functional and beautifully characteristic of a Spanish style home. The home’s exterior also received a makeover that included new wrought iron fencing and gates, specifically designing them to match the style of the house. Just recently, the home’s landscaping plan was updated. Now a profusion of succulents and California desert plants grace this home. Community has been a thread throughout this home’s 80-year history. Today that sense of community continues. Surrounding neighbors have discovered inspiration in this home’s restoration with several adjacent homeowners borrowing design ideas. This home’s rehabilitation is the perfect example of how historic preservation builds community as neighbors help neighbors, through the sharing of ideas, experiences and lives. Photo courtesy of Mark Tran. Setting a new precedent at its fall meeting, Alhambra Preservation Group recognized a particularly fine example of mid-century modern architecture as one of the recipients of its 2013 Heritage Home Award. This marks the first time a home of the post-World War II era has been honored by the organization for the integrity of its distinctive architecture. The post-war period of the mid-twentieth century was characterized by major changes in the fields of architecture and design. Traditional styles were seen as stale and outdated, and Southern California became the epicenter of the modern design movement. Mid-century modern architecture reflects an outlook of post-war optimism, and its designers believed that a forward-looking style could be a vehicle for the creation of a better world. 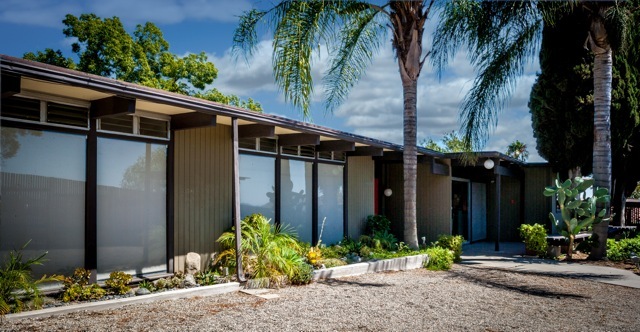 Characterized by the use of new building materials and technologies, these homes, built during the period from 1945 through 1970, featured simplicity and integration with nature. They offered open floor plans and sliding glass doors, encouraging people to go outside and live healthy lives. Many incorporated swimming pools into their private rear gardens. 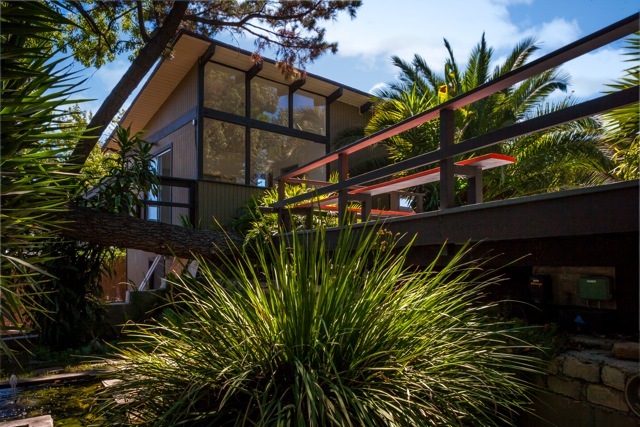 This award-winning home is located on Palatine Hill, overlooking Emery Park, and was built in 1960 for the Bezzant family by the local contracting firm of Colletta and Edgely. Robert Bezzant was employed as Alhambra’s City Engineer; his wife Elaine, was an artist and educator – in addition to being the mother of their six children. Their four-bedroom home was designed in a post-and-beam style, with floor-to-ceiling windows that bathe the rooms in a flood of natural light and provide a seamless transition from the indoors out. A series of wooden decks and landscaped planting areas surround the backyard swimming pool and spa, thereby increasing the useable living space on this steeply-sloping hillside lot. Following a complete and very sensitively-done restoration, this Alhambra landmark was purchased in 2009 by its current owner, who fell in love with the integrity of its mid-century design, its integration into the landscape, and its hilltop location. 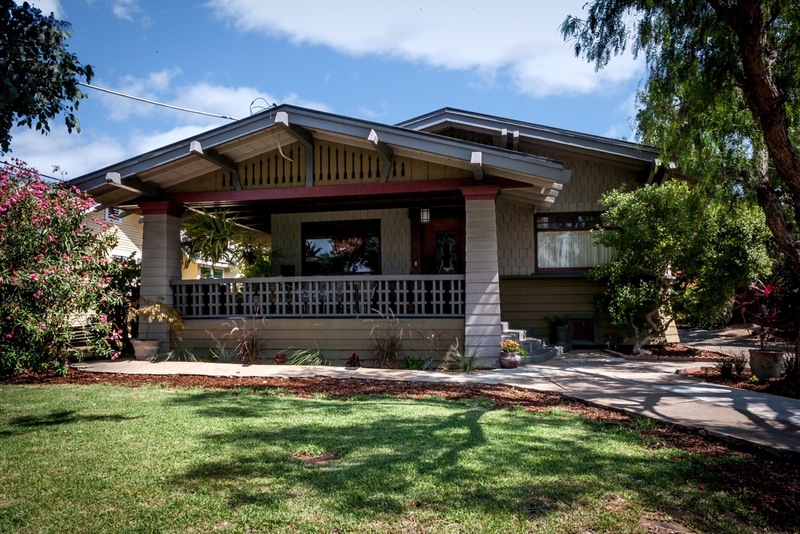 In a recent award ceremony, Alhambra Preservation Group honored the homeowner of a classic 1912 Swiss Chalet Craftsman Bungalow with its 2013 Heritage Home Award. 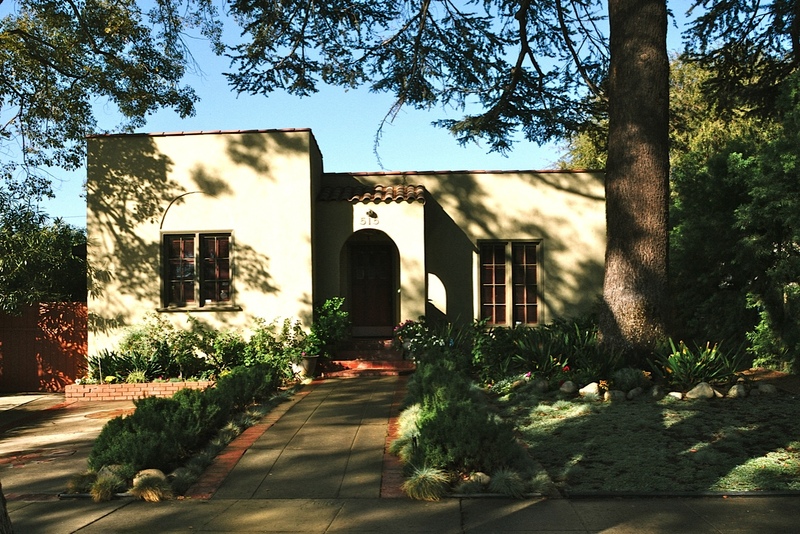 Located in Alhambra’s historic Ramona Park area, this home is one of many houses built by the Ramona Park Building Company just after the turn of the 20th century. “It is Alhambra Preservation Group’s great pleasure to present this award in recognition of the investment this homeowner has made in the preservation of Alhambra’s architectural history,” stated APG president, Christine Olson, in presenting the annual award. 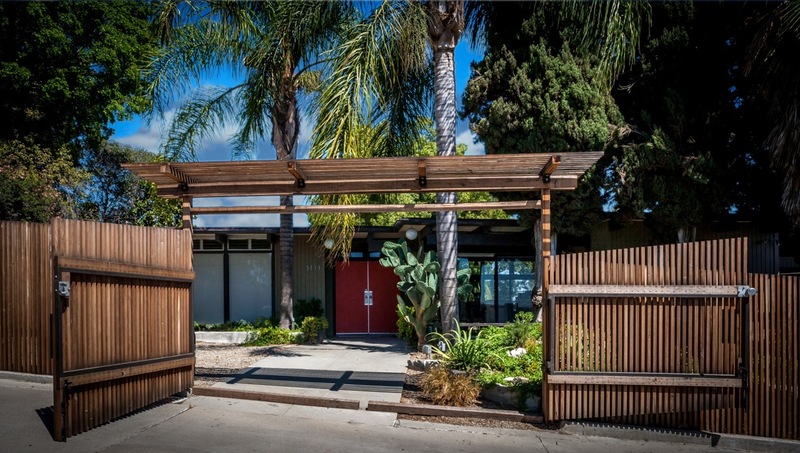 This home, located on the western edge of Ramona Park, features many of the design elements for which the Ramona Park Building Company was known. The company’s principles, John and Daniel Althouse, were contemporaries of the Pasadena-based Greene brothers and had a solid reputation for high-class, high-quality work. Two front-facing low-pitched gables and the influence of the Swiss Chalet style can be seen in the arrow-patterned gable vents. The wraparound porch is offset to the north, supported by columns and is enclosed by a distinctive stickwork railing. Two broad fixed windows flank the front door, with its leaded glass window. Shingles sheathe the structure down to the windowsills, where a flared skirt of shiplap siding wraps the building. Arlow and Georgia Watson had this home custom built in 1912. The Watsons came to Southern California from St. Paul, Minnesota in 1909 with their two-year old daughter, Dorothy. Their son, Arlo, was born in Alhambra. The Watson family lived here for more than thirty years, until Arlow’s death in 1943. 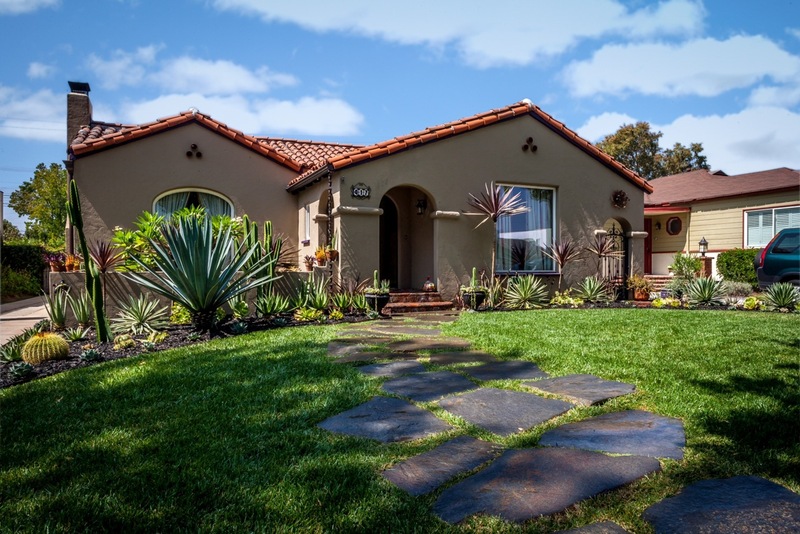 More than 40 years later, the current homeowner was in the market to purchase a “well-built home with real character” in Alhambra. In an interesting twist, the homeowner’s realtor talked about the home in which he had been raised – this very home. The home needed a lot of work! Most of the Douglas fir woodwork had multiple coats of paint and the green shag carpeting throughout. The ceilings had been texture-coated and all of the original light fixtures were gone. In the kitchen, a suspended ceiling was installed over fluorescent lights. Despite its challenges, the homeowner could tell that the home had “good bones and was very solidly built.” It featured a beautiful built-in buffet in the dining room that had somehow managed to survive unpainted. Most importantly though, the home’s essential character was still there – although barely distinguishable under all the paint and carpeting – and the homeowner could see its potential. Today that potential has been realized! The front porch, which was enclosed as a separate room when the homeowner purchased the house, has been removed, and its original use restored with its wooden bead board ceiling painstakingly stripped and stained. The fireplace and chimney have been repaired and restored. In the kitchen, the fluorescent lights and suspended ceiling have been removed and the original straight-pine floor restored. The ugly carpeting has been torn out, revealing the original quarter-sawn oak floors. And along the way, there have been a few surprises. The basement contained a box of beveled glass pieces that the homeowner learned belonged in the home’s front door, which have now been reinstalled. In another section of the basement, the frame and hardware for the folding Murphy bed that was original to the home’s front parlor was found. Its re-installation is a project yet to be tackled. 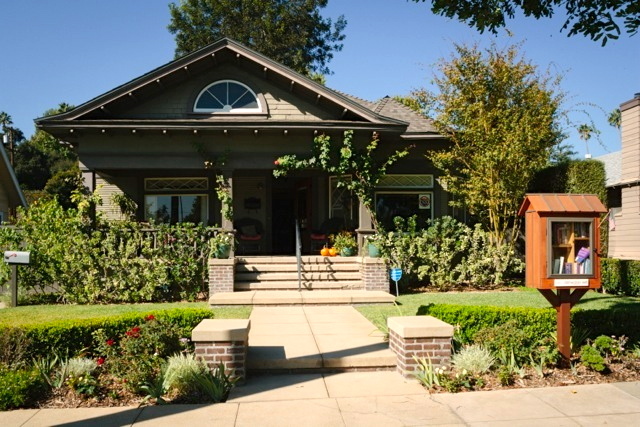 Now, this Craftsman gem welcomes friends and family, restored to its original splendor by a homeowner who looked past a neglected and forgotten old house and saw the beauty and quality that is unique to this home. Thanks to the care and stewardship demonstrated by this homeowner, this home is ready to shine for another century in Alhambra’s historic Ramona Park.